Definition at line 37 of file CTableauLine.h. Definition at line 37 of file CTableauLine.cpp. Definition at line 39 of file CTableauLine.cpp. 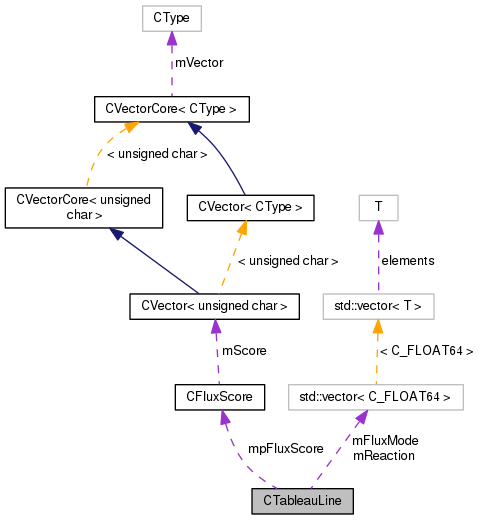 References CONSTRUCTOR_TRACE, mFluxMode, mpFluxScore, mReaction, and mReversible. Definition at line 54 of file CTableauLine.cpp. References CONSTRUCTOR_TRACE, mFluxMode, mpFluxScore, mReaction, mReversible, and reduce(). Definition at line 87 of file CTableauLine.cpp. References DESTRUCTOR_TRACE, mpFluxScore, and pdelete. Definition at line 97 of file CTableauLine.cpp. Definition at line 94 of file CTableauLine.cpp. Definition at line 89 of file CTableauLine.cpp. Definition at line 102 of file CTableauLine.cpp. Referenced by CTableauMatrix::addLine(), CFluxMode::CFluxMode(), and operator<<(). Remove the first entry from the reaction vector Divides m1 and m2 by the largest common factor. Definition at line 137 of file CTableauLine.cpp. Definition at line 113 of file CTableauLine.cpp. Definition at line 56 of file CTableauLine.h. Referenced by CTableauLine(), getFluxMode(), and operator<<(). Definition at line 61 of file CTableauLine.h. Referenced by CTableauLine(), getScore(), and ~CTableauLine(). Definition at line 46 of file CTableauLine.h. Referenced by CTableauLine(), getMultiplier(), and operator<<(). Definition at line 51 of file CTableauLine.h. Referenced by CTableauLine(), and isReversible().